From Cape Town take the N2 national road in the direction of the airport, onward through the Strand & Somerset West area and over Sir Lowry’s Pass. Continuing along the N2 past Grabouw and over the Houw-Hoek Pass all the way to the R43 off ramp to Hermanus. Drive along the R43 through the town of Hermanus towards Stanford and Gansbaai. 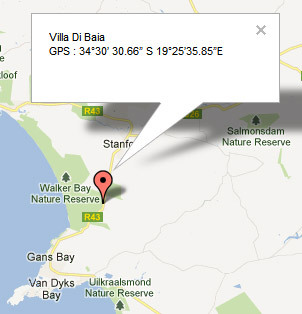 Villa di Baia is approx 30km from Hermanus; 8km past Stanford on the right is the access control gate to the farm, (just after the Walker Bay Fynbos sign).